What Does Eric Swalwell (Who Called Trump a Russian Agent) Have to Say? A few months ago, Rep. Eric Swalwell (D-CA) didn't blink when he called President Trump "an agent of Russia." He hadn't changed his mind as of a few days ago, when he again accused 45 of colluding with the Kremlin. He later suggested that Trump was terrified over reports that special counsel Robert Mueller's Russia investigation was nearly finished and he was ready to release the findings. Do we believe @realDonaldTrump when he says he "doesn't mind" if the Mueller report is released publicly? Do we believe in Santa Claus? Now that Mueller's Russia report is finished - sans further indictments - Swalwell is at a loss. No more indictments can only lead us to conclude that Trump did not work with Russia to win the 2016 election. Attorney General William Barr is reviewing the report and is expected to share the findings with Congress as early as this weekend. CNN had Swalwell on as a guest again on Friday just as the report reached Barr's hands. The congressman was adamant that Congress receives the full report before Trump gets it so he doesn't have a chance to "edit" it. 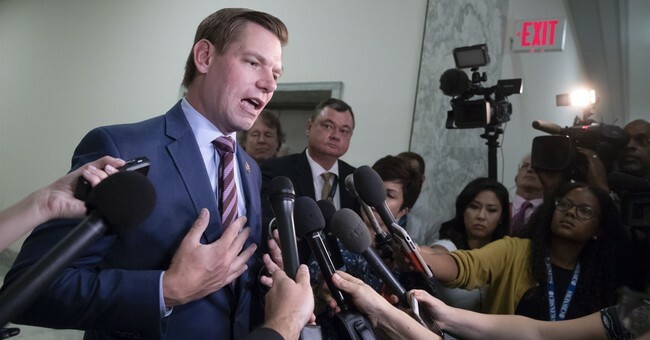 The president doesn't deserve it first, Swalwell argued, because he's one of the "subjects" of the investigation. Swalwell was not that concerned about a heavily redacted report, because, he noted, they now have subpoena power. He stressed the importance of hearing from the special counsel. "It's my personal view the report will not be fully accepted by the American people until we hear from Bob Mueller," he said. Despite DOJ guidelines that state a sitting president cannot be indicted, Swalwell said Trump is nowhere near out of the woods. "I don't see how he does not have indictments waiting for him, considering he's individual 1."